Our home, Planet Earth is undergoing rapid and sustained destruction of its eco-systems. Climate Change is possibly the biggest threat to life on the planet, especially when most of the effects will be felt in Muslim countries. For example; Future water crisis in the Middle East, flooding in Bangladesh, desertification of sub-Saharan Africa and much more… All of this will lead to more wars and environmental refugees. Do Muslims have any answers to these issues? 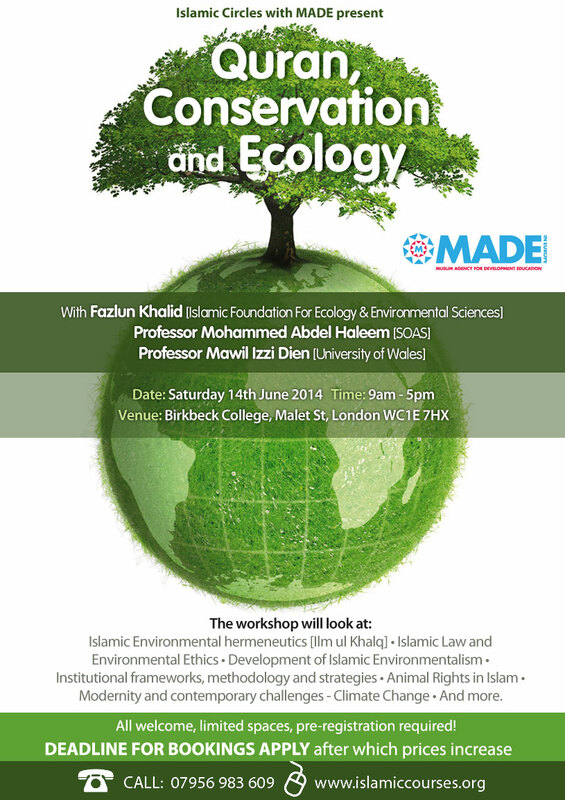 Come to an informative course and learn more about Islamic environmental themes,the threat of climate change and whether or not Muslims can address the global environmental challenge that faces us all. Those looking for a career change, or Muslim students looking for some ‘real’ life work experience or anyone who simply wants to give back something ‘real’ to the Muslim world , all these projects require sincere people from all backgrounds and a wide range of skills and professions. Bismillah, here is your chance to become custodians of the earth (Khalifah’s) as the Qur’an tells us! Described as “the single most active ‘Islamic’ environmentalist alive today” and Grist Magazine included him as the only Muslim among fifteen world leaders in religious environmentalism, calling him “the foremost expert on ecology from an Islamic Perspective” and The Independent on Sunday ranked him 81st among Britain’s top 100 environmentalists and 2004 winner of the Muslim News Fazlur Rahman Award for excellence in Engineering, Science and Technology. Fazlun Khalid is the Founder-Director of the Islamic Foundation for Ecology and Environmental Science [IFEES] based in Birmingham, England. He has served as director of training at the Alliance of Religions and Conservation [95-02] and as a consultant for World Wildlife Fund, WWF. In 1995 he chaired a major gathering in Japan and produced the Ohito Declaration for Religion, Land and Conservation which pledged all the major faiths to work together in Addressing environmental problems. He has been an adviser and consultant to numerous international agencies and academic institutions including the World Wide Fund for Nature International, the World Bank, CARE USA and Harvard University. And has also been the founder of the Muslim Education Forum UK and its General Secretary between 1989 to 1994. In September 2009 Khalid was invited by United Nations Secretary General Ban Ki-moon to participate in the Climate Change Summit in New York City. He was invited to speak at the Vatican in October 2010 as part of the interfaith initiative “Building Bridges of Hope: Success Stories and Strategies for Interfaith Action”. In January 2011 he was invited to chair a workshop on “The Faith Factor: Religion’s Role in Addressing Global Trends and Challenges” at the World Economic Forum Annual Meeting in Davos, Switzerland, where he was joined by Ex-US President Bill Clinton. World-renown Quran expert, Professor Abdel-Haleem was born in Sharqiyya, Egypt and is a Hafiz of the Qur’an. He has as a BA in Arabic and Islamic Studies from Cairo University and a PhD from the University of Cambridge. He has been teaching Arabic at Cambridge and London universities since 1966, including courses in advanced translation and the Qur’an. He one of the leading experts in the study of the Qur’an and some of his publications include, “Understanding the Qur’an: A Study of Themes and Style”, “Keys to Qur’anic Exegesis”, “Grammatical Shift for Rhetorical Purposes: Iltifât and Related Features in the Qur’an”, “Qur’anic Orthography”, and “English Translations of the Qur’an: The Making of an Image”. Professor Mawil Izzi Dien is Reader in Islamic Studies at University of Wales, Trinity St David. He has been writing and teaching about Islam and the environment since the early 1980s, when the United Nations published his first study, and is a world authority on the subject, regularly featured in mainstream media. He has authored numerous books and articles, mainly on the subjects of Islamic law, economics and enivronmentalism, eco-labelling, climate change, sustainable development and Islamic legal ethics regarding the natural environment. Recently he authored “The Environmental Dimensions of Islam”. He has been a consultant on Islam to the Alliance of Religions and Conservation (ARC) and President of the Institut Europeen des Sciences Humaines Saint-Leger-Fougeret and was Council Member in the British Society for Middle Eastern Studies. Recently has been calling for more a greener Hajj. Professor Abdel-Haleem was born in Sharqiyya, Egypt and is a Hafiz of the Qur’an. He has as a BA in Arabic and Islamic Studies from Cairo University and a PhD from the University of Cambridge. He has been teaching Arabic at Cambridge and London universities since 1966, including courses in advanced translation and the Qur’an. He one of the leading experts in the study of the Qur’an and some of his publications include, “Understanding the Qur’an: A Study of Themes and Style”, “Keys to Qur’anic Exegesis”, “Grammatical Shift for Rhetorical Purposes: Iltifât and Related Features in the Qur’an”, “Qur’anic Orthography”, and “English Translations of the Qur’an: The Making of an Image”.